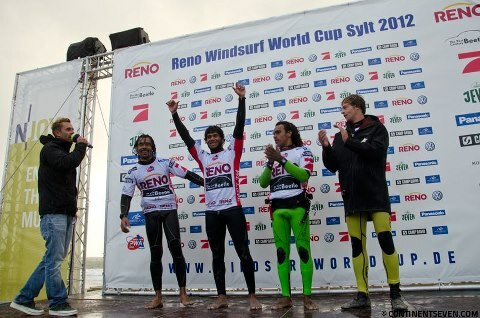 Day 2 just wrapped up at the 2012 PWA Sylt World Cup, and Philip Koster came out on top beating Victor Fernandez. The Heat was exciting with Victor Fernandez dominating early on, with great wave rides, but in the last minutes Koster came back with a nice wave 360 and one handed one footed back loop to take the lead, and win the single. 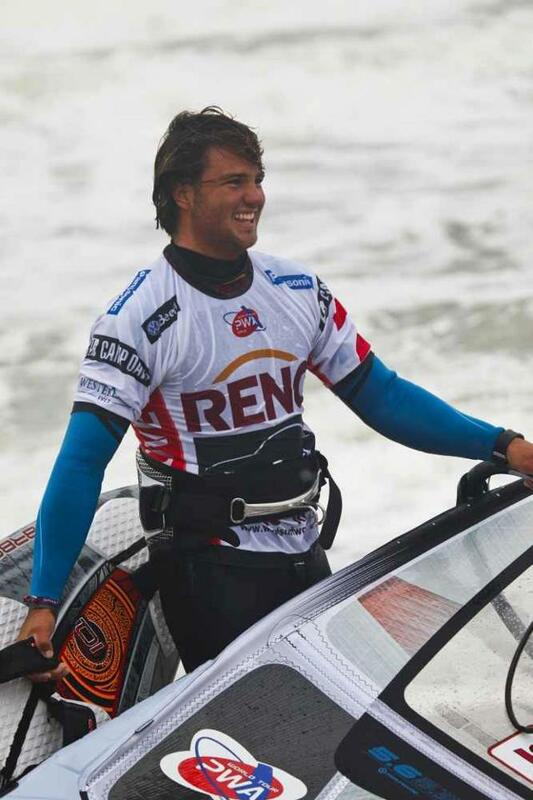 ON the losers side, Ricardo Campello dominated over Alex Mussoline. Ricardo’s aggressive style had him throw many more jumps, including his signature onehanded one footed forward, he’s currently the guy doing this. Ricardo jumping ability put him in the lead over Mussolini who showed some nice wave rides, with tackas and a nice downwind 360. Check Back tomorrow for even more action and check out PWAWorlTour.com for a live stream and mroe detailed reports. The final event of the season is underway, as freestyle, wave and slalom sailors compete in Sylt. The Freestyle single elimination is complete, congratulations to Gollito who took it. Adam Sims landed a burner 900 at West Witterings during the 5th round of the UKWA Freestyle Tour. Pretty sick. What’s your ride of choice? We’d go for a van, or something small maybe a GTI, or WRX STI. September 25th, 2012 the swell keeps rolling in for Bernd Roediger at Hookipa. Enjoy the video! Windsurfing with Olya Raskina from Windsurf Beauties on Vimeo. A year of training, traveling and organizing Windsurf Beauties camps, here’s a look inside Olya Raskina’s life with a lil fun part at the end. Filmed in Hawaii, Mauritus and South Africa by good friends Lena Bam, Lars Petersen, Christian Gobel, Sergey, Ivan and Zan Zanz. Music from hip hop mixtape New Style Volume 3. Thanks to ROXY for making the video, thank you other sponsors JP-Australia, NeilPryde, Five Square windsurf center, MFC and all my love to my family and friends. Next coming up is “Made in Ocean”, a new Russian windsurfing movie. Not the highest quality but outstanding moves from Gollito. The 4x World Champion was recently in Tarifa, training and also filming for a couple of new projects that are to come from Andre Paskowski. Enjoy this little teaser. As if it knew it was time to stop, the wind dropped for the closing day of the 2012 Cold Hawaii PWA World Cup in Klitmøller on Sunday, after a week of tough competition between the best 43 wave windsurfers in the world. After three successful years of competition, Klitmøller, for decades a place of pilgrimage for the windsurfers in the know, is now firmly on the professionals trail. “It’s an established part of the tour now,” Rich Page, the PWA tour manager, said. “Klitmøller was an event that that had been years in the development phases working with Rasmus Johnsen (head of new media and technology at the Active Institute at the University of Aarhus) and then later with Robert (Sand, the event manager). So that when it came to fruition it was very well organised. And grow it has, driving a digital revolution in the sport. In their inaugural year in 2010, the organisers of Cold Hawaii brought live streaming video technology to the windsurfing World Cup for the first time and this year the introduction of live scoring by the PWA has helped revolutionise the sport. Dany Bruch in the wave and getting some air time. All to show off the new Severne S-1. The official summary video of the 2012 Defi Wind, which took place from May 17 -20 in Gruissan on the Mediterranean Sea. The event had 850 participants for the largest global gathering of windsurfers, with pros and amateurs mixed on the same starting line. The video is in French but has English subtitles, enjoy. Some sick freestyle action from Karpathos Greece. The fall is the time of year when many wave spots begin going off. Ireland is no exception and has been kicking off this year. Check out these perfect lines in Gowlane Strand and Brando Bay from Clive Boden. Enjoy the action, we say it looks like fun! A group of Israeli freestyler sailors have released this freestyle action clip. It was filmed in Eilat, Israel and features Yarden Meir, Tom Goren, Adam Gavriel, Alon Mor, Nimrod Dadon and Roy Goren. Enjoy!